VIRAL: What’s wrong with this billboard in Batangas? In the Philippines, it’s not unusual to see government project billboards accompanied by the name and a large photo of the politician in charge of the project. Despite the Aquino administration’s campaign against putting faces on billboards, posters and banners of government projects, these types of materials are still rampant in the country. As the campaign period for the 2016 elections draws near, we should expect more politicians to use project billboards to promote themselves in the coming days. While it’s certainly not strange to encounter politicians’ self-advertisements on project billboards, one particular billboard in Batangas has captured the attention of netizens for a particular reason. On Facebook, netizen Jb Angeles shared a photo of a billboard of a certain government project in Mataas na Kahoy, Batangas. At first glance, you’ll probably assume it’s an ordinary project billboard which includes the name of the project as well as the name and photo of the public servant behind it. However, a closer look at the billboard would reveal what’s wrong with it. 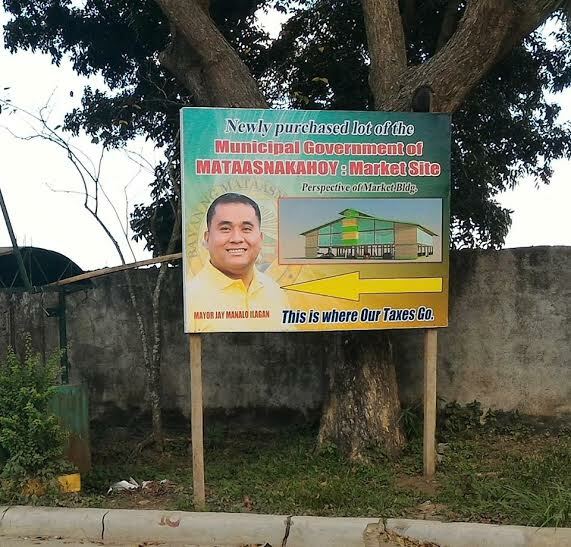 On the photo, you’ll easily spot Mataas na Kahoy Mayor Jay Manalo Ilagan’s photo strategically placed on the lower left corner, while the phrase “This is Where Our Taxes Go” is located across the photo on the lower right side. An arrow pointing to the photo of Ilagan is found in between the two. Merely basing on the billboard, it’s safe to assume that the taxpayers’ money goes to Ilagan. Angeles’ post has quickly gone viral amassing 836 shares on Facebook as of this writing. While many netizens blamed the layout artist for the epic billboard failure, several netizens sarcastically pointed out that Ilagan should be re-elected for his “honesty”. The Anti-Epal policy of the Aquino administration urges public officials who launch programs for their constituents not to put their names and faces on signage to promote themselves. Although the policy was widely lauded when it was announced, many politicians refused to follow the order.